Starbucks will launch its annual sakura (cherry blossom) collection in two batches this February. The first part debuting on 15 February features designs of freshly bloomed sakuras in a yellow and pink design. 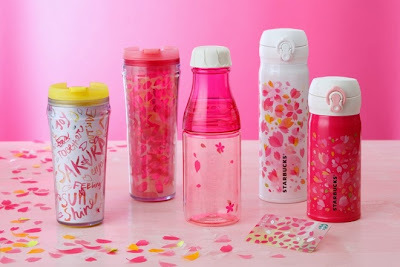 It includes the Sakura sleeve tumbler 250ml (1600yen), Sakura white mug 430ml (1600yen), Sakura Handy Stainless Tumbler 480ml (4200yen), Sakura Handy Stainless Tumbler 360ml (3630yen), Sakura pink mug 360ml (1500yen) and Sakura card in Sakura Breeze. The second part, to be released on 27 February, showcases sakuras in full bloom with a more vibrant color scheme. It includes the Sakura Tumbler 240ml (1430yen) and 350ml (1530yen), Sakura Sunny Bottle 500ml (2100yen), Sakura Handy Stainless Bottle 500ml (4200yen), Sakura Handy Stainless Bottle 350ml (3630yen) and Starbucks card in Sakura Brilliant. 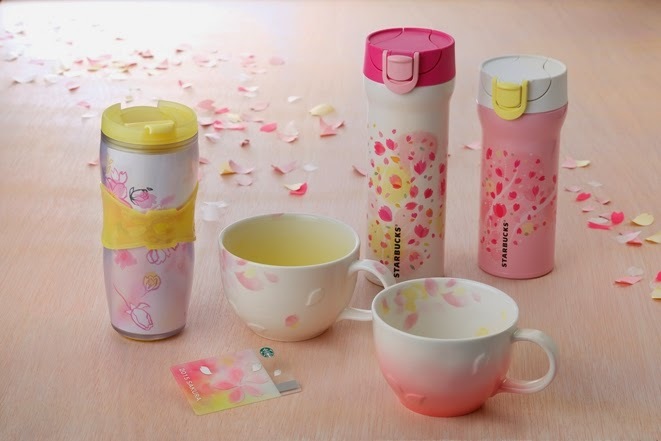 In previous years, the Sakura collection of tumblers and mugs have been available in Singapore as well but these are usually released without any publicity so if you want these, start stalking the stores soon as there's no telling when they will quietly turn up. These are guaranteed to always sell out in the blink of an eye. 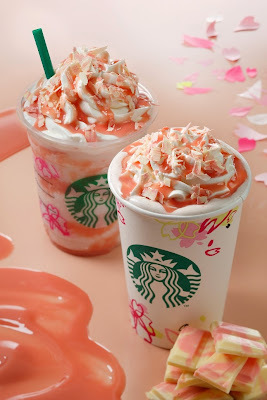 The new seasonal drinks are Caramel Sakura Chocolate Latte and Caramel Sakura Chocolate Frappucino. I am always so envious of the Asian Starbucks sakura line. It is never made available here, including the sakura drinks. My "sister" is now living in the States so I don't get my annual gift of the Sakura tumbler line anymore. This year's line is so pretty and am totally loving the stainless tumblers. Thank you for sharing! The Singapore Sakura collection is out!